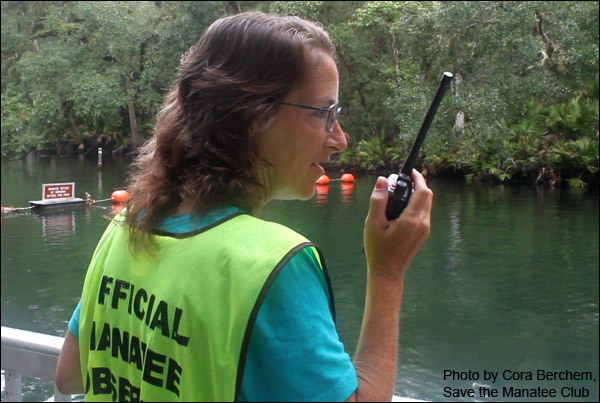 Now in its third season, the Blue Spring Manatee Observer Program is a collaboration between Blue Spring State Park, Save the Manatee Club, the Florida Fish and Wildlife Conservation Commission, Sea to Shore Alliance, and Volusia County Environmental Management. The program runs during the summer months from April to November when the park is open for swimming, tubing, snorkeling, kayaking, and scuba diving and sees large numbers of visitors. 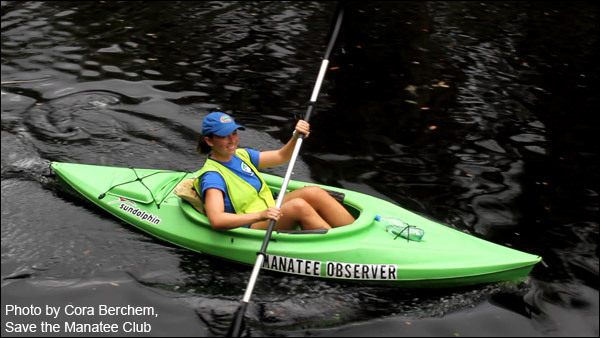 Volunteer Ally Greco covers a manatee shift from the kayak, making sure swimmers keep a safe distance from manatees. While historically only a few manatees would visit the spring during the summer months, the past couple of years have seen an increase in manatee usage of the spring, resulting in the need to have volunteers assist the park to prevent harassment of manatees during that time. Elementary school teacher Melissa Landreville agrees. “I educate kids in the classroom on a daily basis, so coming out here was just a natural next step,” she says. Volunteer Jackie Cheers covers a manatee shift from the boardwalk. Over the radio she communicates with the kayak volunteer, letting her know that manatee Cassie is resting under the steps at the swim entrance. This summer not only saw the birth of manatee Annie’s fourth calf, but two recently-released manatees learning how to adjust to life in the wild also frequented the park almost daily. In addition, many mother manatees brought in their young to show them the spring, making a volunteer presence ever more important. Enjoy a short video to learn about the volunteers’ experience as they talk about why they joined the program, what it means to them, and some of the challenges they encounter.